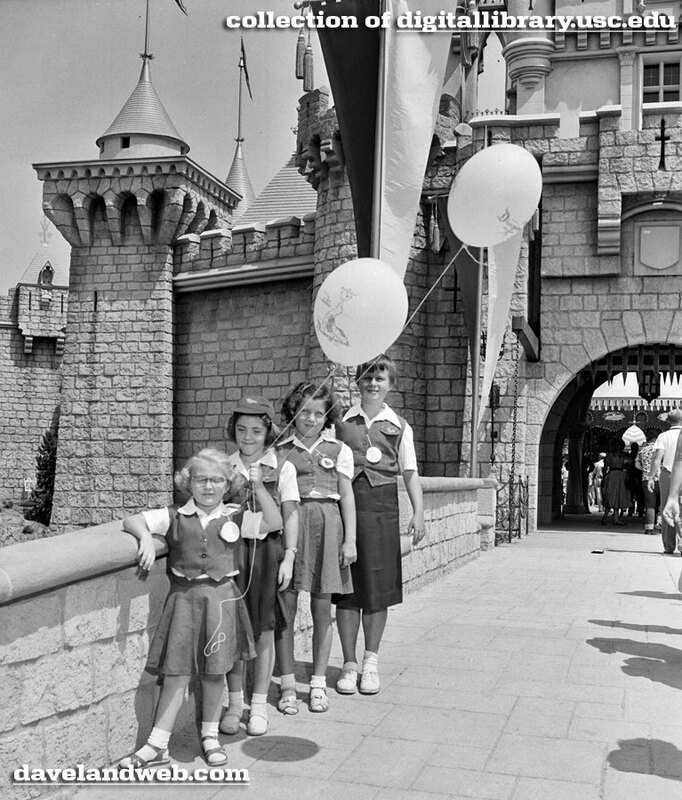 Los Angeles Area Camp Fire Girls from the Alhambra District pause on the bridge in front of the Fairy Castle at Disneyland. 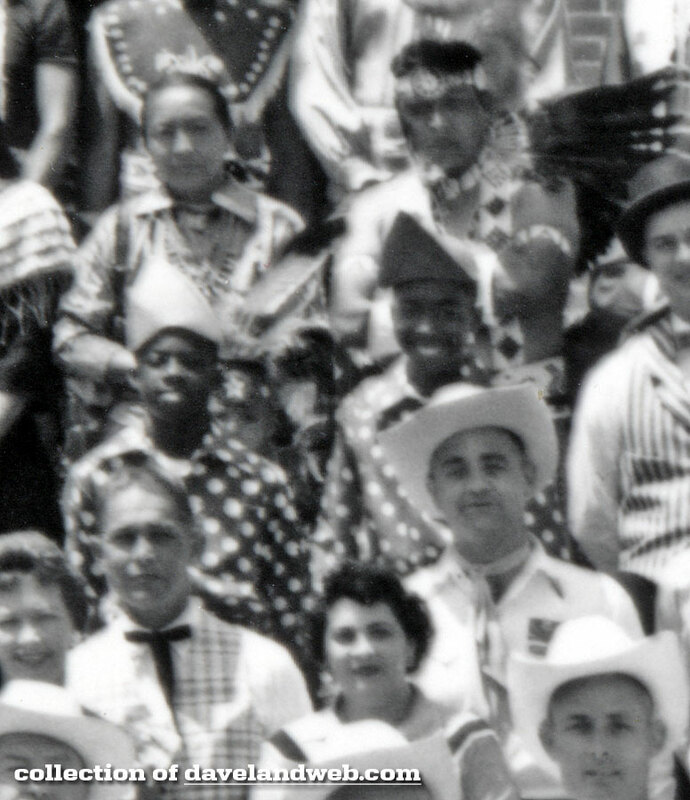 Left to right: Sandra Ayers; Linda Webb; Sandra Smith; and Brenda Lewis, were among 200 girls given the day at Disneyland by the Camp Fire Girls for selling the most candy mints in the Camp Fire Girls' candy sale. 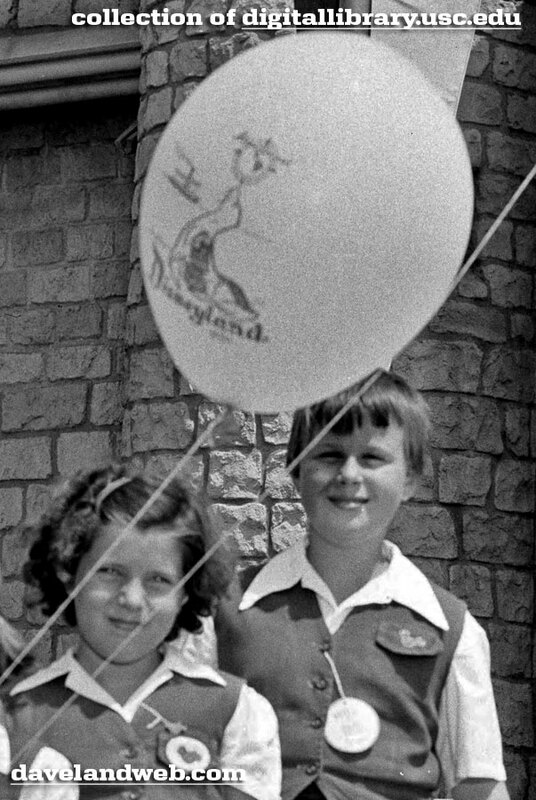 Have to zoom in for a closer look at the balloon, which features what appears to be a seal, balancing something on his nose. 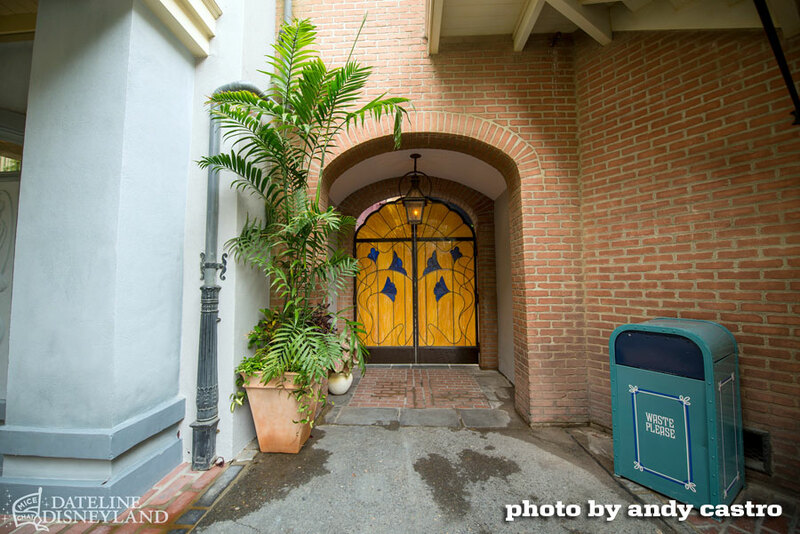 It almost looks like the Adventureland logo seen on The Wonderful World of Disney. 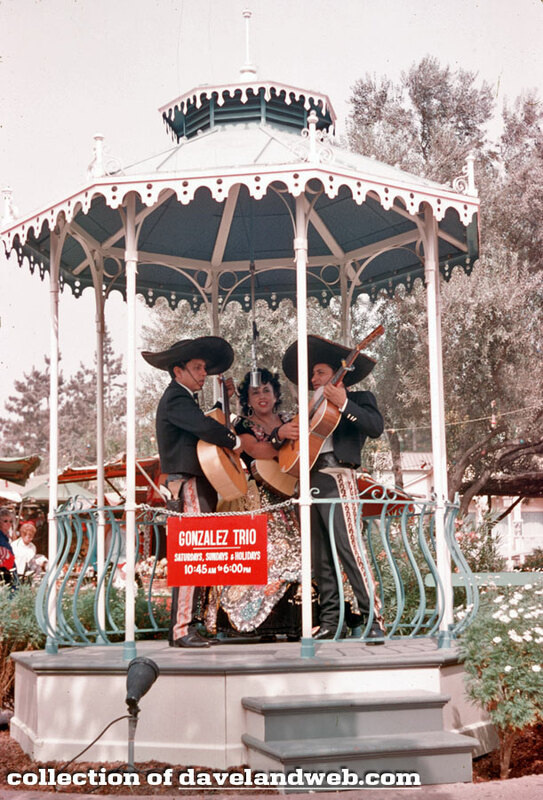 See more vintage Disneyland photos on my main website. 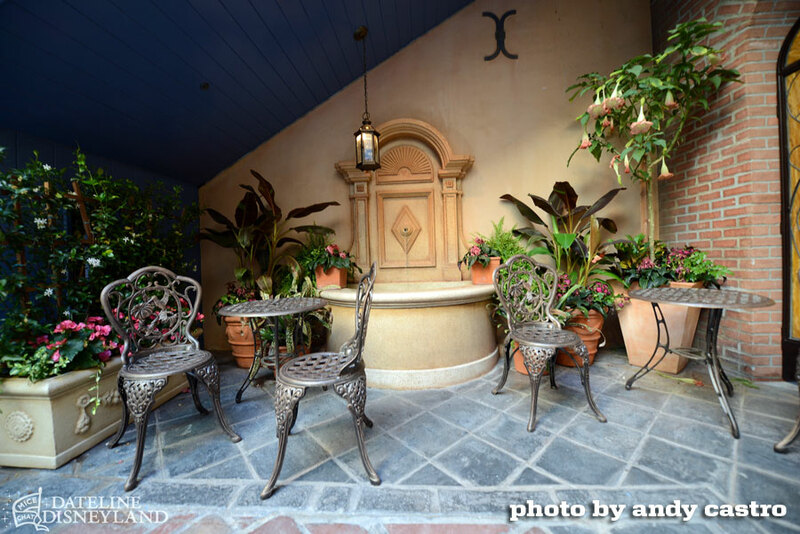 Yesterday's post covered how the Club 33 remodel impacted the regular pass-buying guest. The guest who spends: $150 per Park Hopper ticket + $17 for parking + approximately $50 for food/snacks (and that's extremely conservative) + $50 souvenirs = $267. If you are spending the night, you'll spend a minimum of at least $130 (again…very conservative) for a room. GRAND TOTAL FOR ONE PERSON: $397. That's at least a $400 day. For one person. Wow. Want an Annual Pass? One that doesn't have blackout dates and also includes parking? You'll be shelling out $700. For the next level up in service and status, a VIP Tour would probably be what you are looking for. At a rate of $315-500 per hour (depending upon the season) with a minimum of 6 hours, you'd be spending a total of $1,890-$3,000. PLUS admission. Not enough status for you? Is your wallet still bulging with cash to burn? 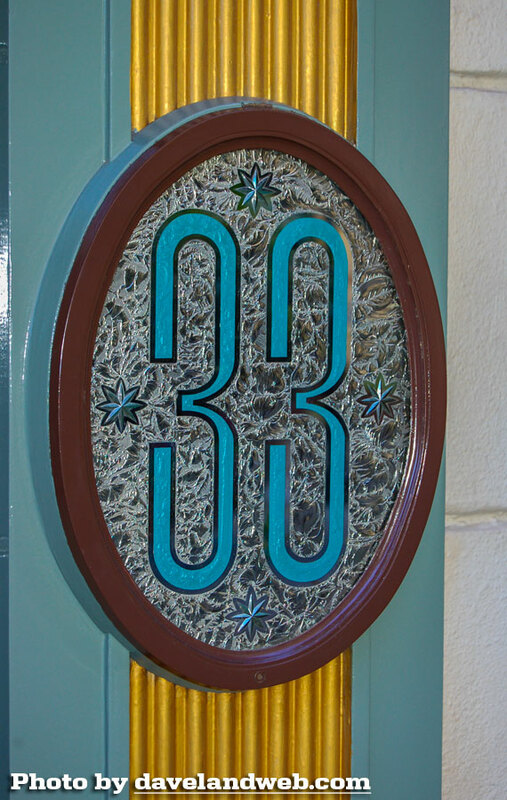 Your next step would be to attempt to get a Club 33 membership. 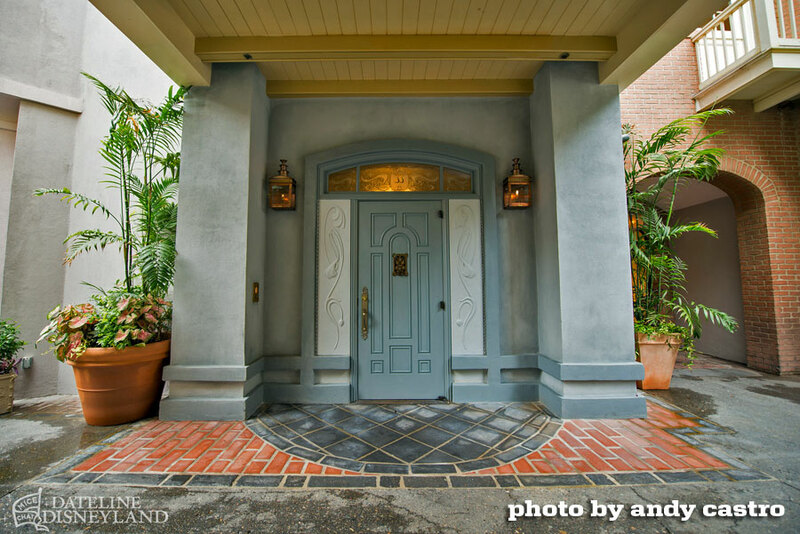 The unique thing about Club 33 was that it was the ONLY loyalty program that existed at Disneyland. Buy a Park ticket, have a magical day, exit the park, and you're back to zero as far as the Disney Corporation is concerned. You won't be given a discount or any kind of incentive to come back. Same thing for the Annual Passholders. Even at the Premium level, you don't rack up points or gain any special privileges for the years you continue buying. Every year, you are back to square one. 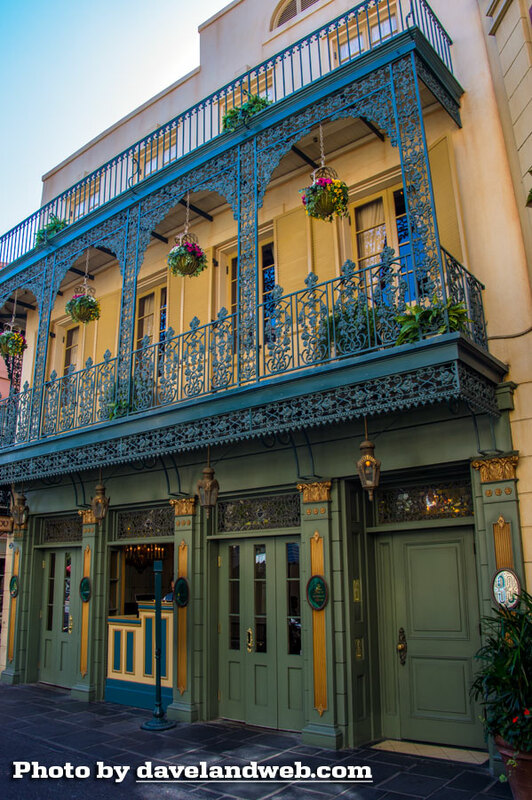 At Club 33 though, you plunked down your initial wad of cash (at one time it was $10,000) and then paid the approximate equivalent of a one-time VIP Tour Guide every year thereafter. 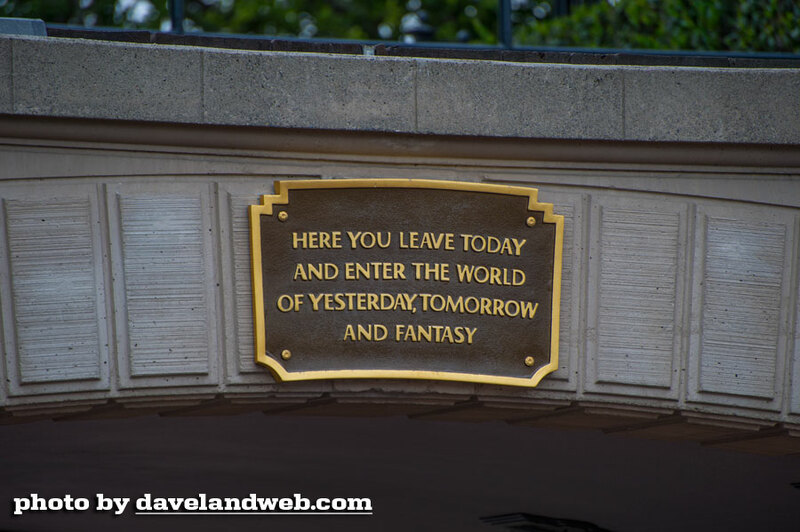 For Disneyland fanatics who couldn't get enough of the Park, this was a no-brainer! 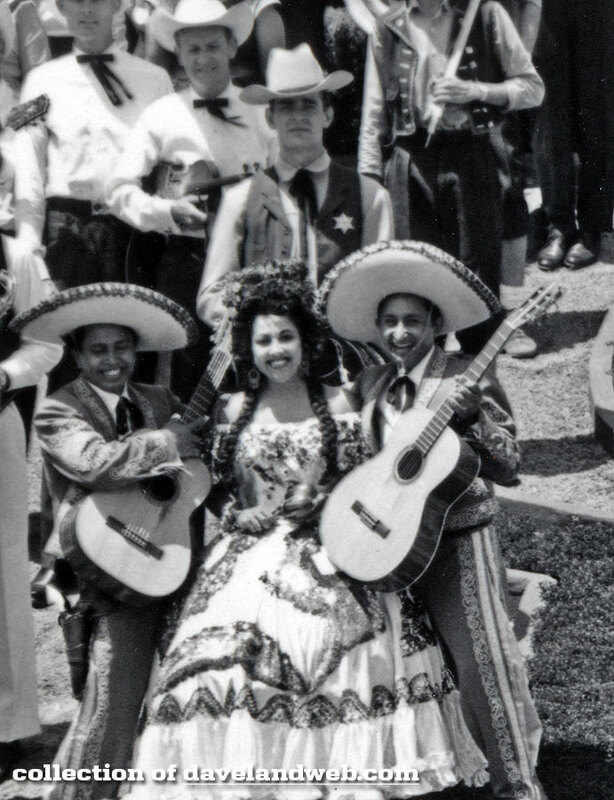 You also had the friendship and camaraderie of other members who renewed every year. 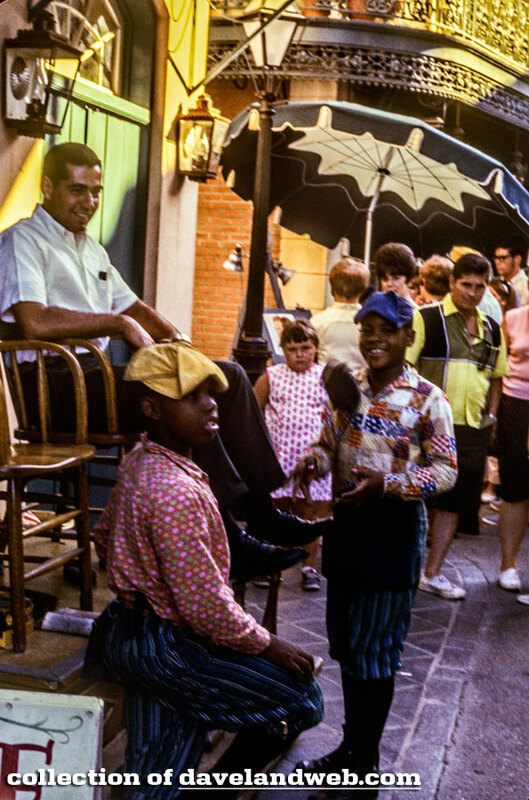 They drank the Disney Kool Aid and automatically renewed every year, getting to know the Cast Members while creating a familial bond with them. Life was good. 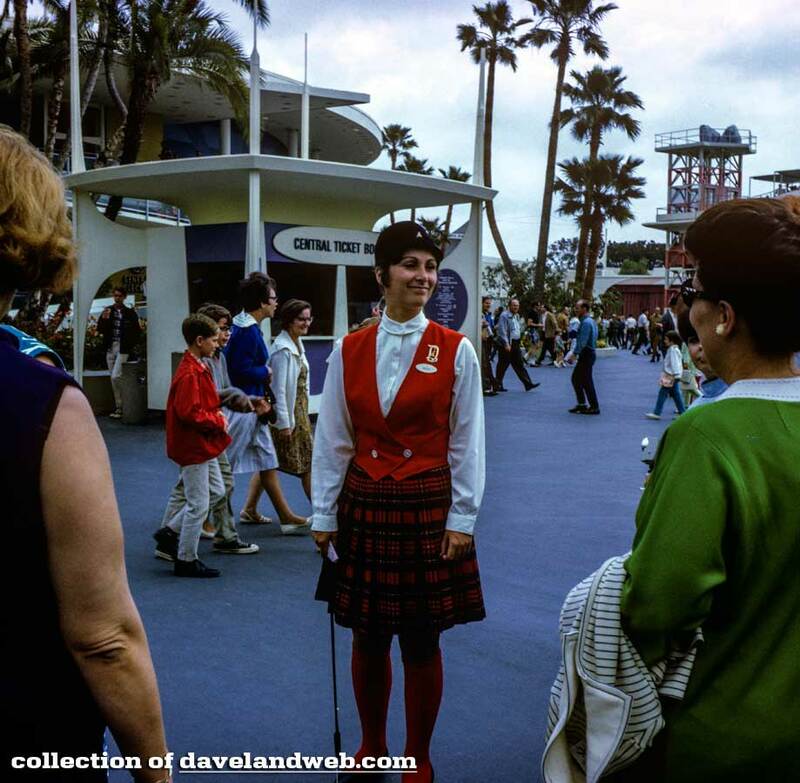 At one time, the waiting list for this magical place was YEARS long. You could put your name on the list and expect to collect Social Security before you ever got a phone call. Then in 2012, something happened. No new Gold and Silver memberships were added to the existing roster; instead, a new level of membership was created and titled Platinum, which required an initial investment of $25,000 with annual dues of $10,000 (now raised to $14,400 annually). 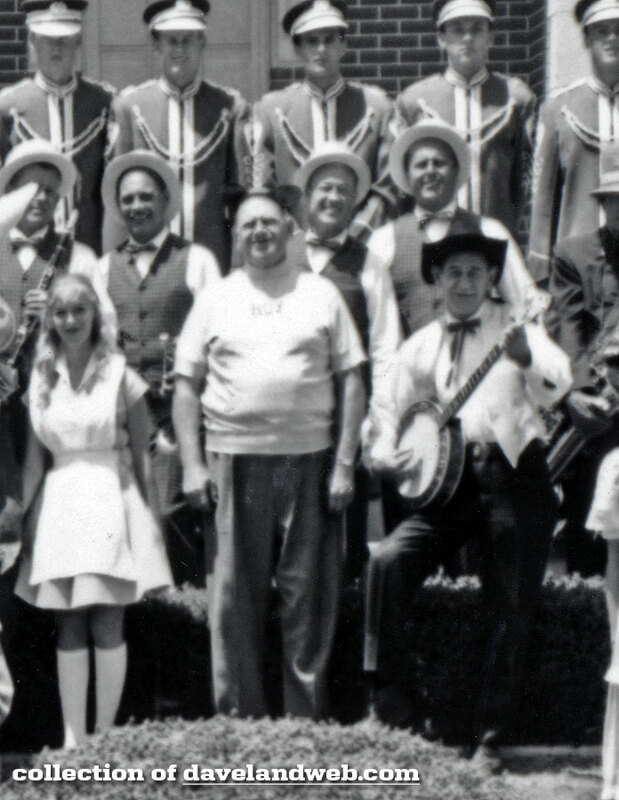 These new members were allowed to use 1901 in Disney California Adventure. 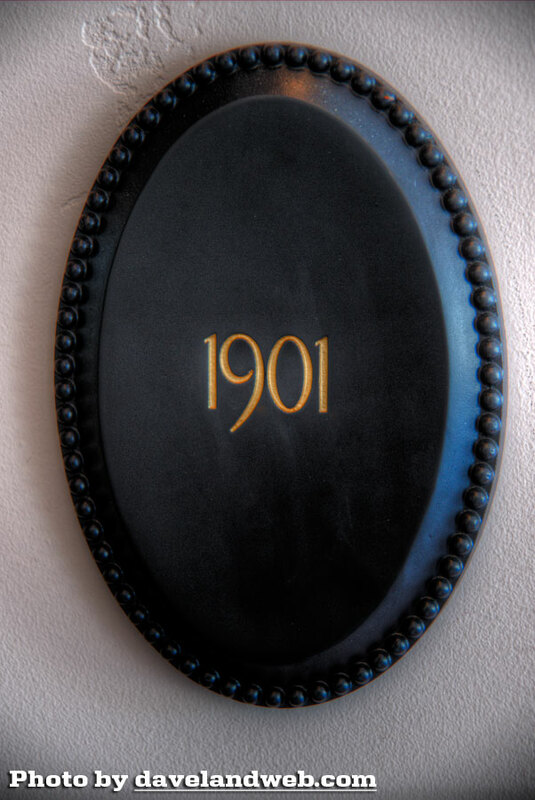 The Silver and Gold members were told if they attempted to enter 1901, they would risk losing their membership. 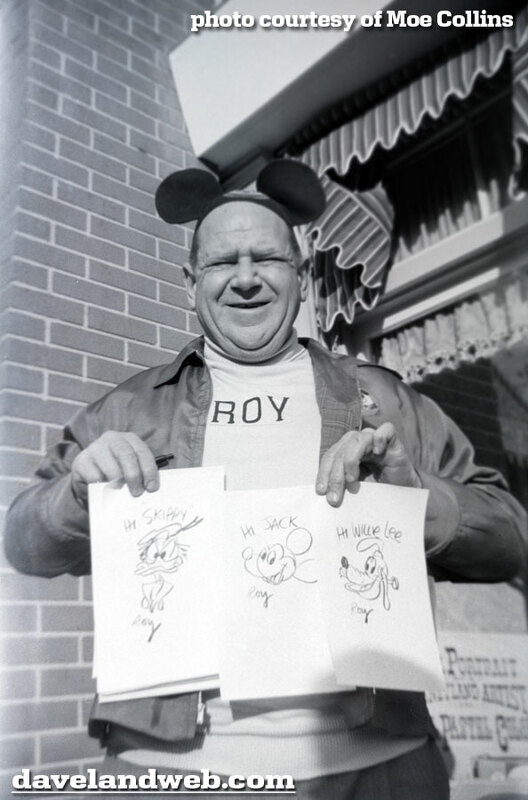 The paltry Gold Member $3,800 annual dues obviously was not of value anymore to Disney. 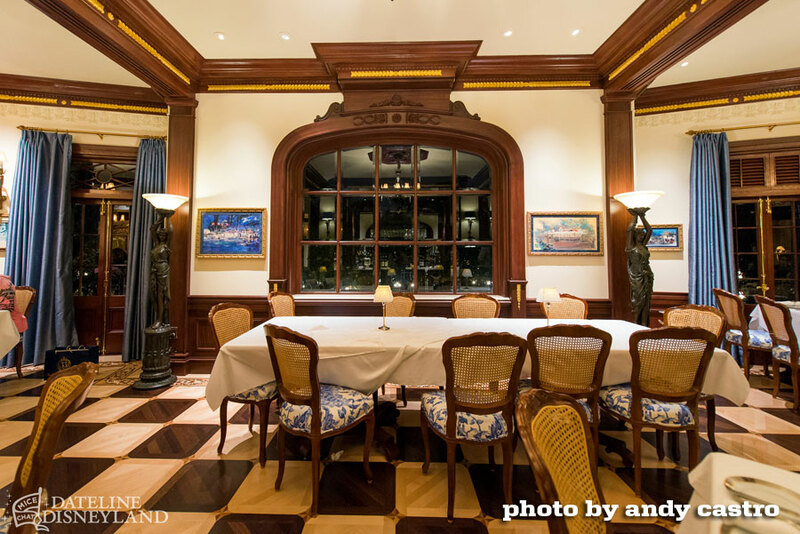 When Club 33 shutdown in January for the remodel, all members were allowed to use the Hollywood Room in the Carthay Circle Restaurant for special occasions until Club 34 (as it has been unofficially dubbed) would reopen in July 2014. They still were not allowed in 1901 (Heaven forbid!). 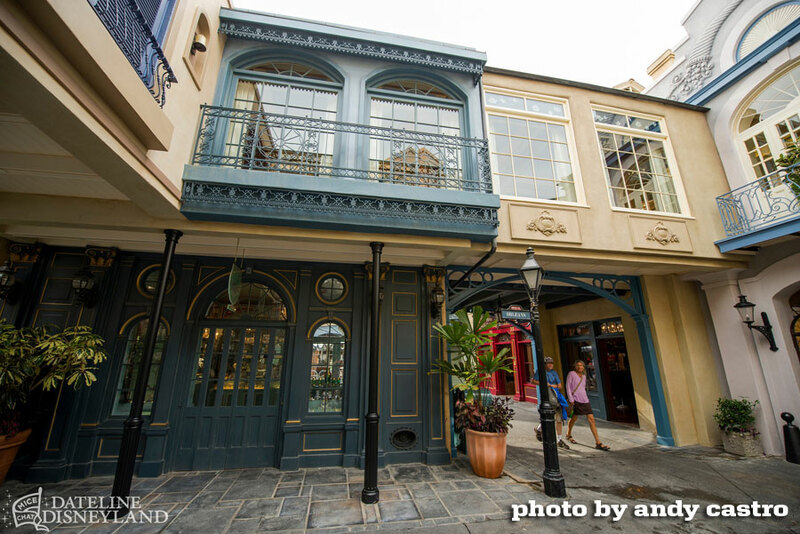 There was no discount provided for this inconvenience; to entice members to go ahead and renew in January, Gold Members were assured that they would have use of the new Jazz Lounge being built above The French Market. 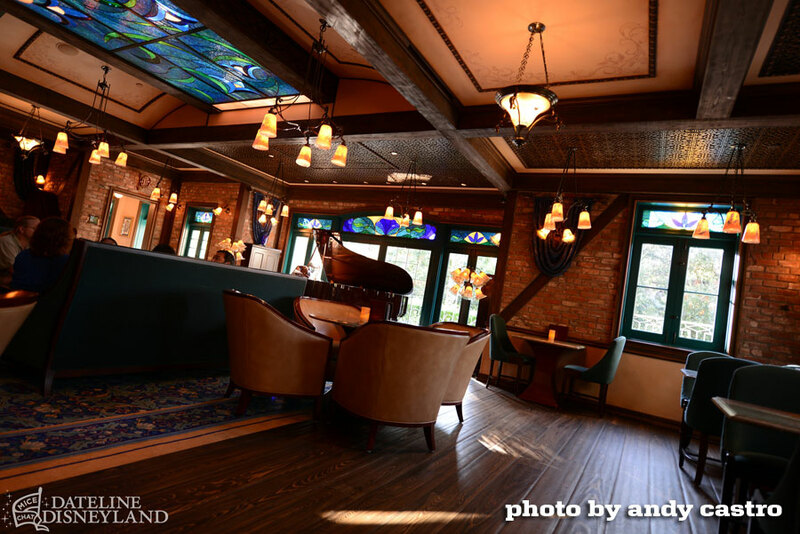 Note: although it is being called the Jazz Lounge, so far, the only music that will be playing there is not "live," but rather on a Yamaha Disklavier Reproducing Piano. I guess that saves having to pay a musician. Although they were still smarting over the Platinum snub, most renewed anyway and looked forward to better levels of service and an improved physical space; both had slipped substantially in the last few years. 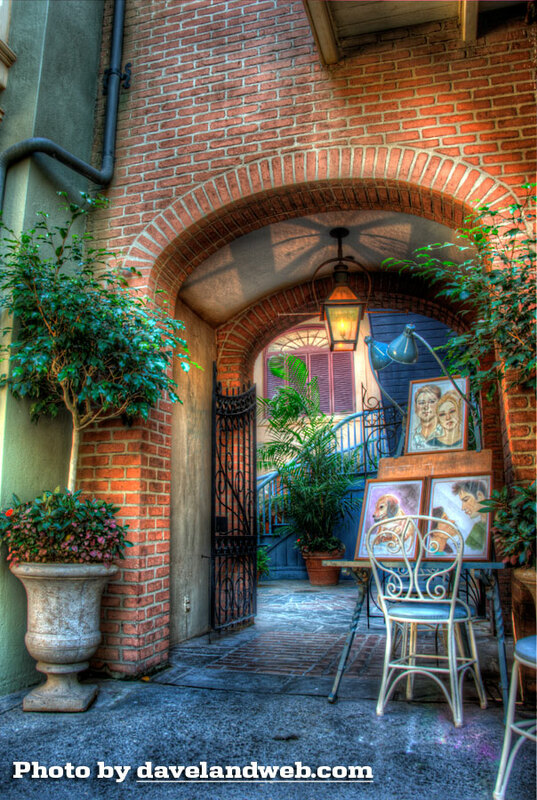 What Club 33 members see as they sit in the Court waiting for their table to be ready. Something ironic about the former entryway being covered by plastic. Not even real stained glass. minus the hideous merchandising that was dumped in here seasonally. 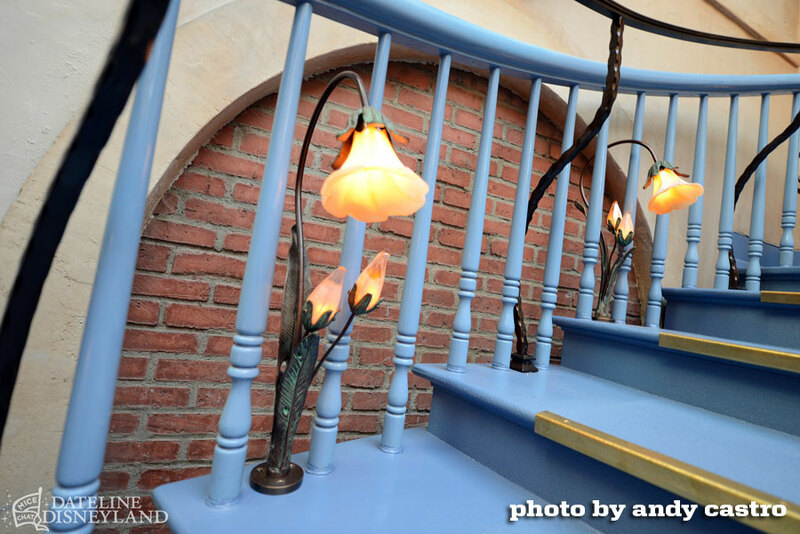 and the metallic vines that have been added to the gracefully curving staircase. 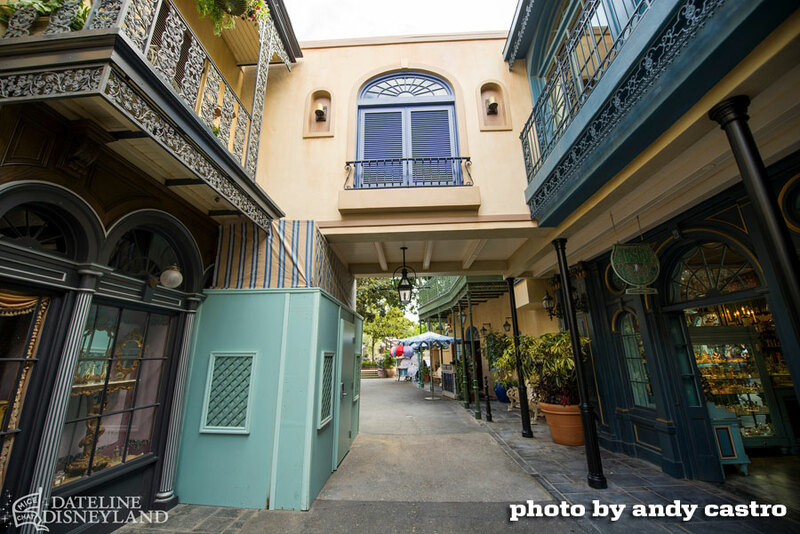 Like much of the Club 33/New Orleans Square renovation, it recalls this scene in "Cinderella." You really shouldn't try to shove a size 10 foot into a size 5 shoe. It just doesn't work, and it's definitely not pretty. At the Dog-and-Pony show last month, members were introduced to the new merchandise offerings (tacky) that featured the new logo (I've already commented on that ill-conceived mess). 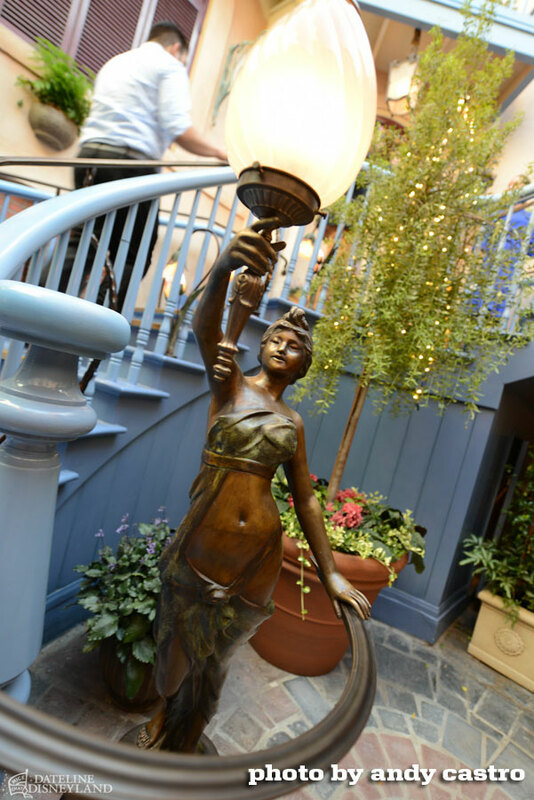 The food, familiar to those who'd dined at Andrew Sutton's Napa Rose and Carthay Circle, failed to "wow" members, who had not been consulted about what they wanted. It was obvious that the dishes served did not meet their expectations. 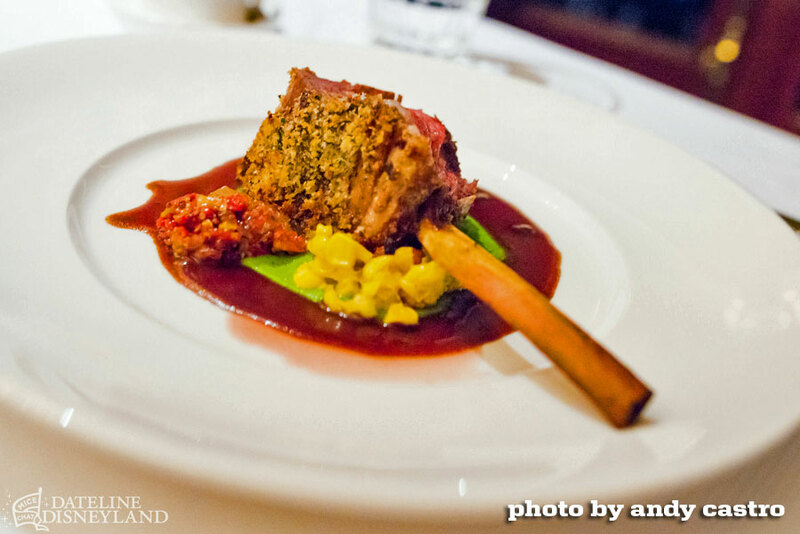 A beautiful plate is not always the top concern to those who dine out. 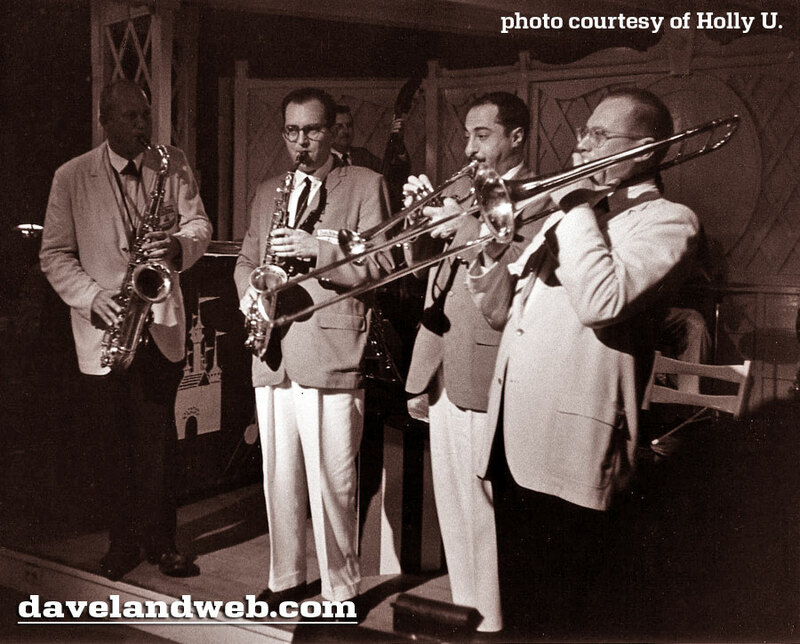 The biggest blow came when Gold Members were told that unless they had dinner reservations (which comes out to a minimum of $100 per person), they would not be allowed to use the Jazz Lounge. While you digest that, I'll show a few photos of the interior, graciously supplied by Andy Castro. 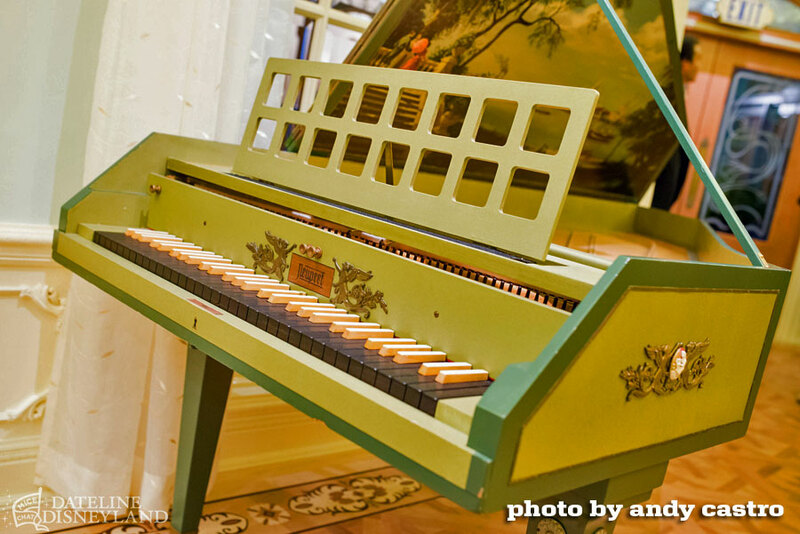 The harpsichord made the transition. 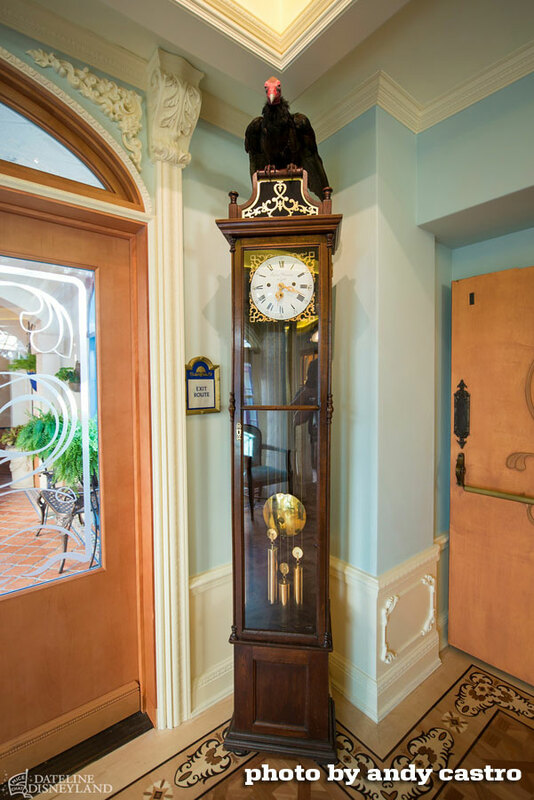 One of the vultures from the historic Trophy Room (a casualty for a larger kitchen) was plopped atop this grandfather clock. The interior and decor are almost unrecognizable to me. 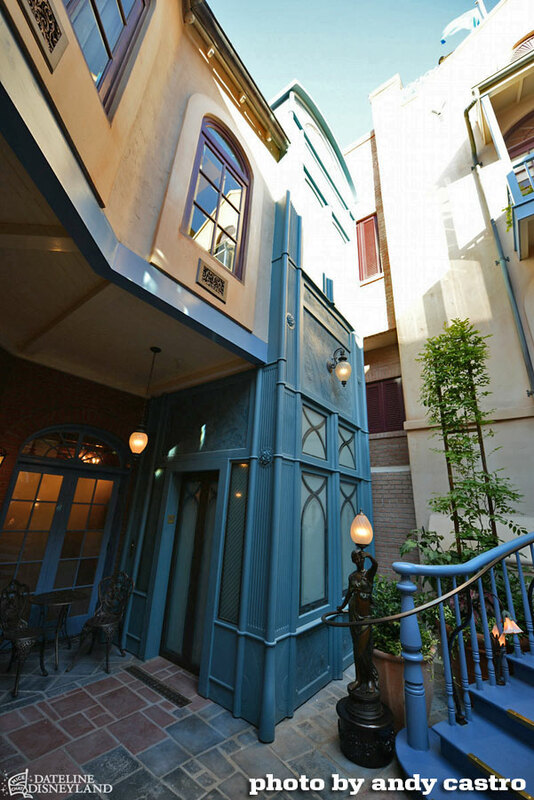 They are akin to the Dream Suite, not the Victorian-style that Walt and Lillian lovingly created for the original Club. One of the biggest questions for me is why would you have a menu at a supposedly exclusive club that mirrors at least 2 other restaurants in the Resort? 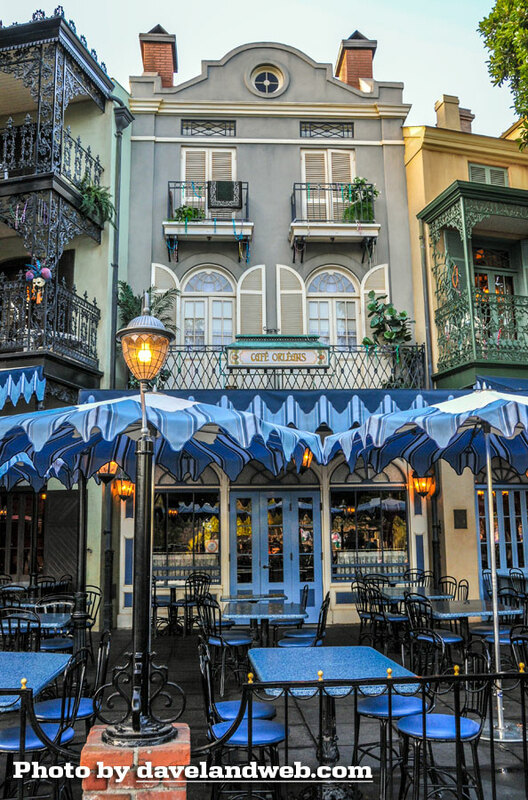 Additionally, why would you remove the history and unique flavor that made the Club so special, and replace it with something that has no relation to the area (New Orleans Square) in which it resides. 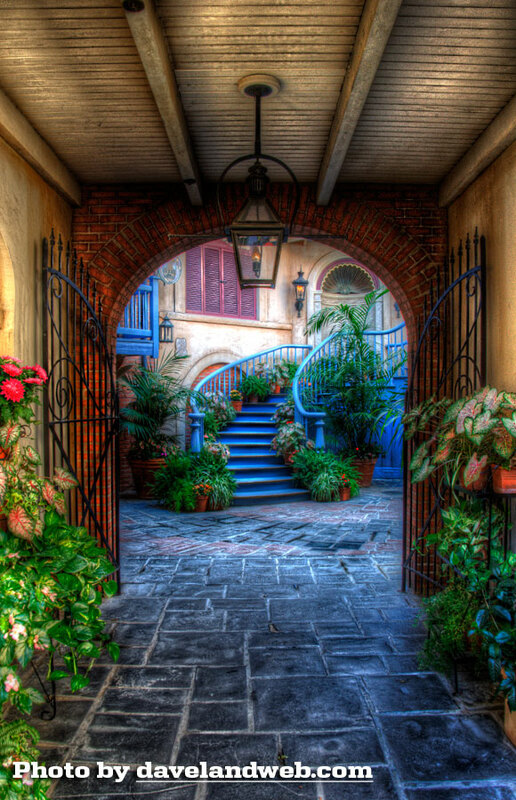 I've been to New Orleans many times, and this interior has nothing to do with that historic city. 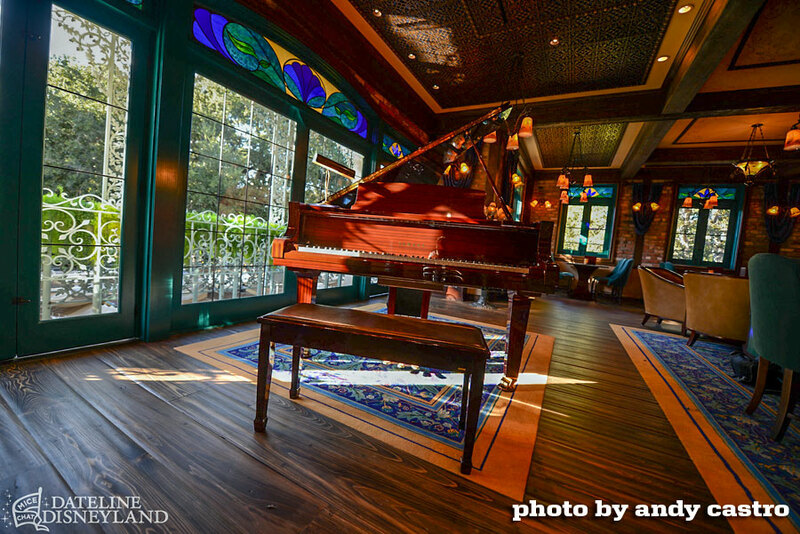 Sure, it looks nice enough, but why would anyone plunk down thousands of dollars to experience this when you could visit any other "fancy" restaurant/lounge in the Resort and get the same ambiance? If a picture can be worth a thousand words, then this one speaks volumes. 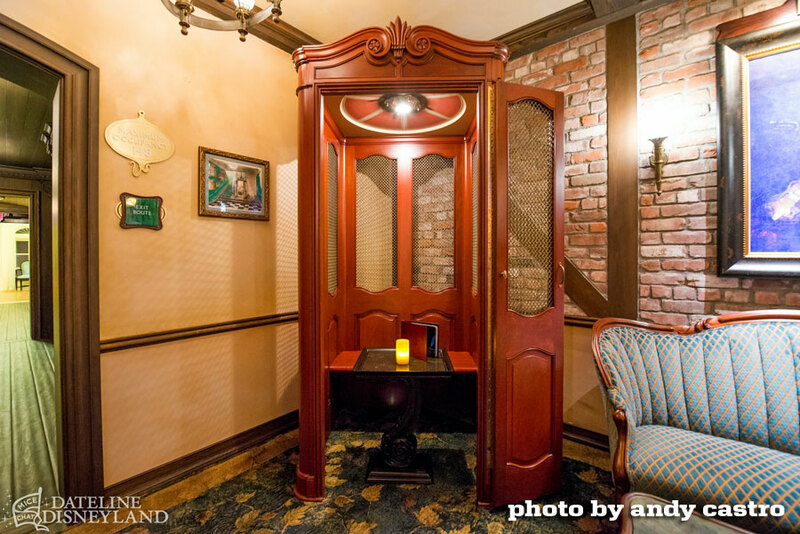 Recognize this tiny enclosed lounge space wedged in the corner? 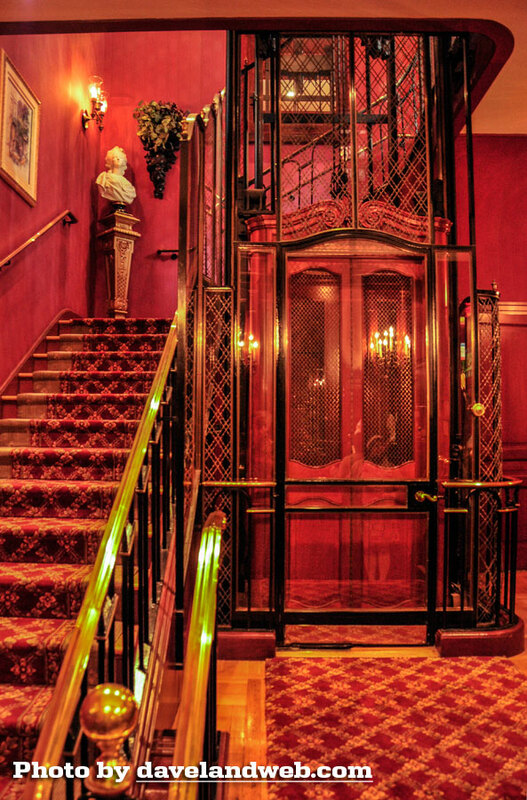 It was once the elevator in the lobby of Club 33. 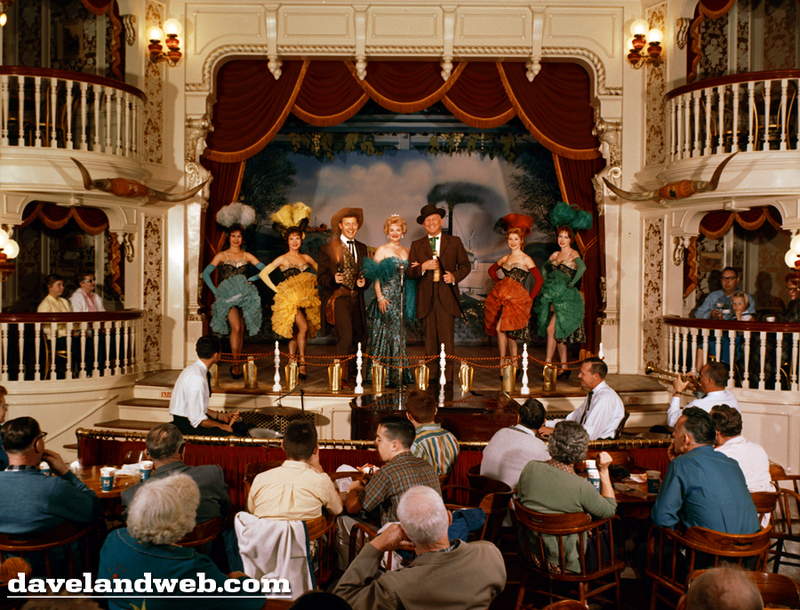 The one Walt had built specifically for his VIP restaurant/lounge. It has been stripped of all use and meaning. Need I connect the dots? Yesterday, a comment was left on the blog that possibly Disney was planning to eventually open the club to the public; perhaps this is why they made the changes allowing it to be so conspicuous. I highly doubt that. Just like the Pressler years, I believe Management has seen the amount of money people are willing to pay for Premium Passes and even for the Platinum Membership, and they are going to see just how far they can push it. So far, they haven't hit the threshold, but I have a feeling they are close. 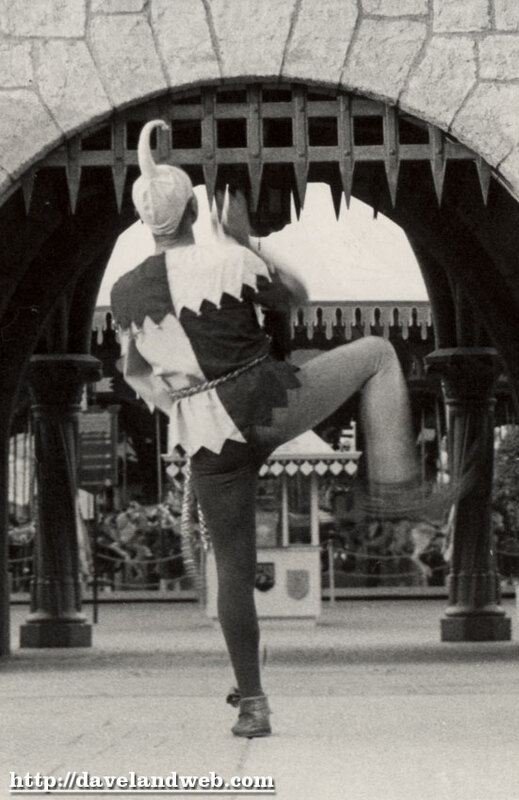 Another person asked "When did Disneyland become so shi shi?" If I wanted to experience "shi shi," Disneyland would not rank anywhere on my list of places to go. 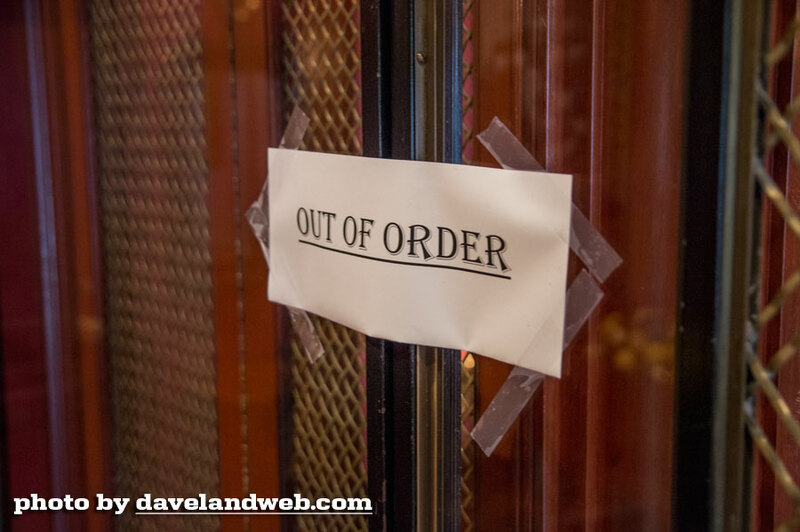 For levels of quality and service, it falls far below what I would call a truly elegant, tasteful, and gracious experience. I don't think the people who put the new Club together would know what "shi shi" was if it bit them in the a$$. 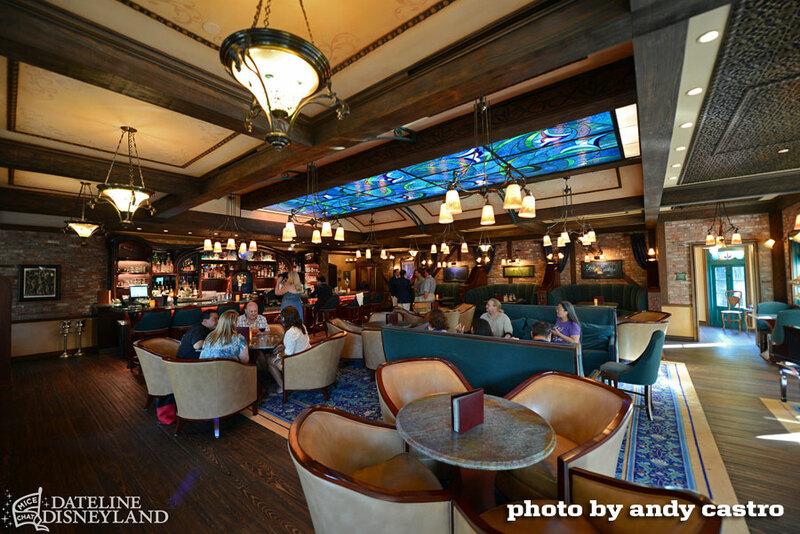 Expanding the kitchen and adding the lounge allows the Disney Corporation to host more high level parties and events; these can bring in the big bucks…much more than a mere $100 a plate dinner would. I truly believe this is what drove the changes. 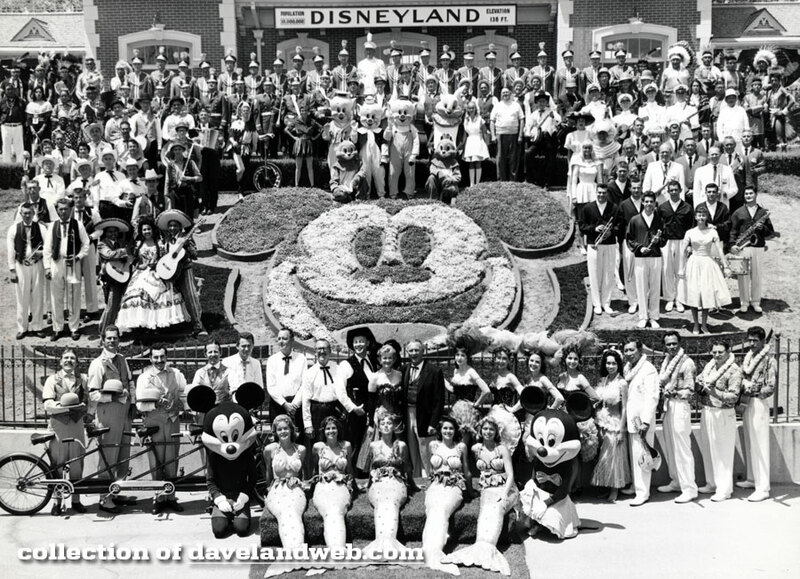 Ever since the 50th Anniversary in 2005, the amount of premieres, special events, and exclusive parties has mushroomed while the space to handle them inside the park has not. 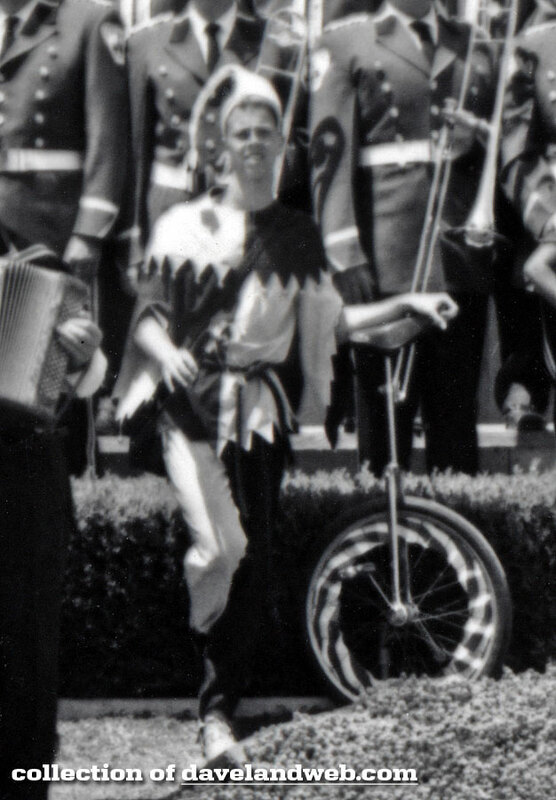 Has the Disney Corporation gone too far? Have they raised prices and lowered quality to a degree that they will alienate patrons like they did back in the Pressler years? 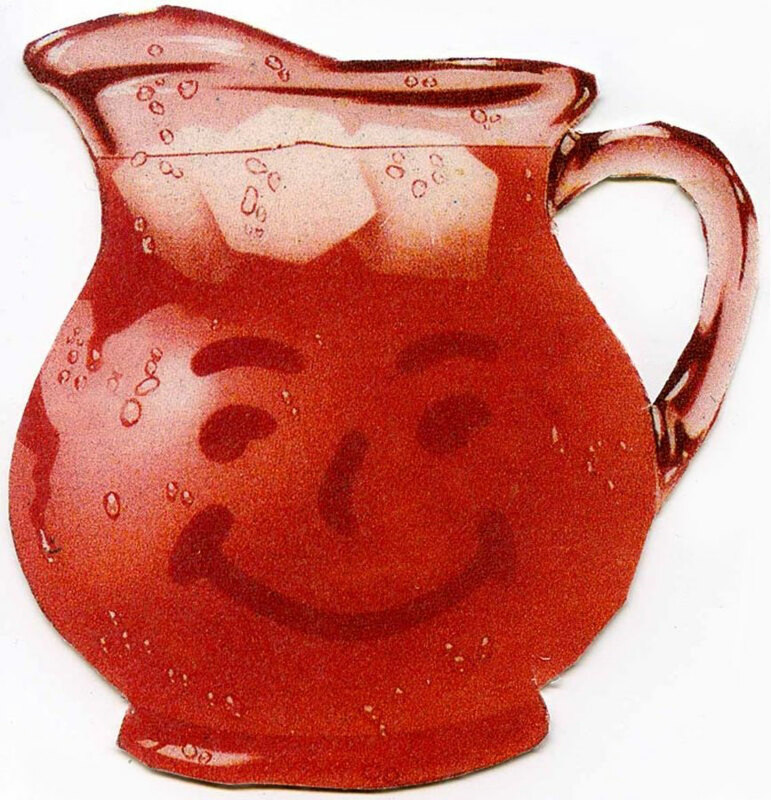 I think the Kool Aid is wearing off. Somebody better mix up a stronger batch. 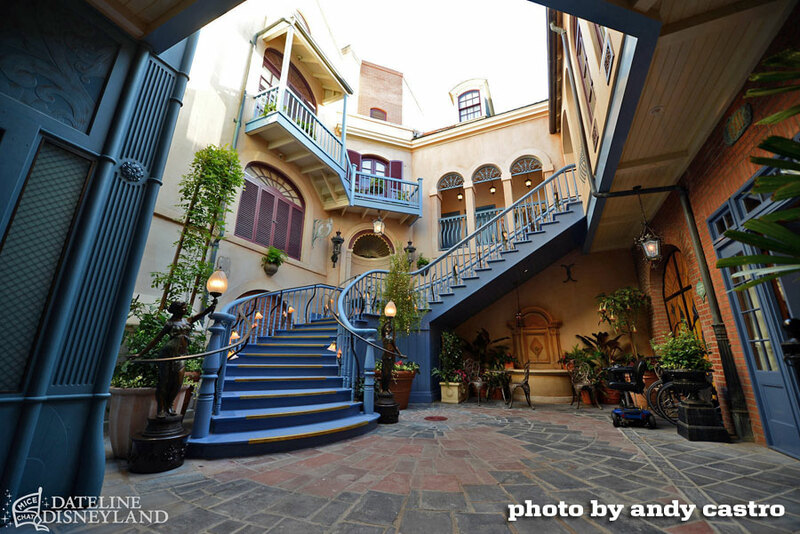 See more Daveland Disneyland Club 33 photos at my main website. 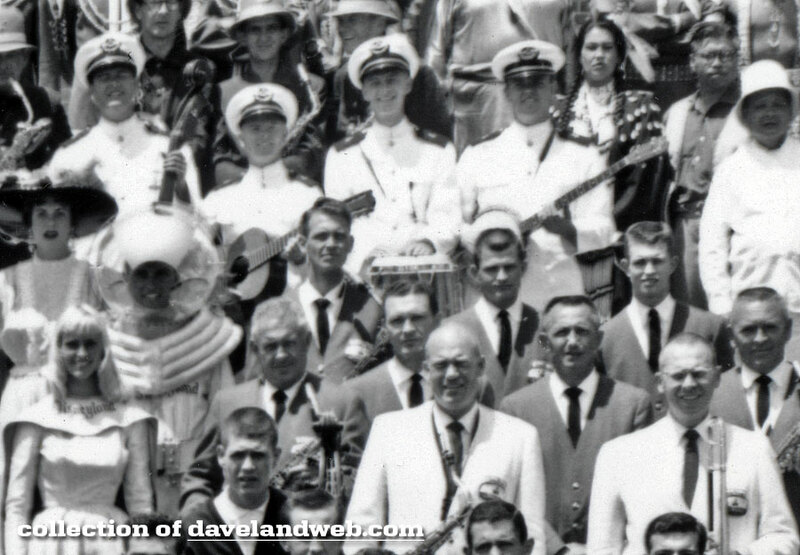 First, many thanks to Andy Castro for generously allowing me to use his photos in today's post. 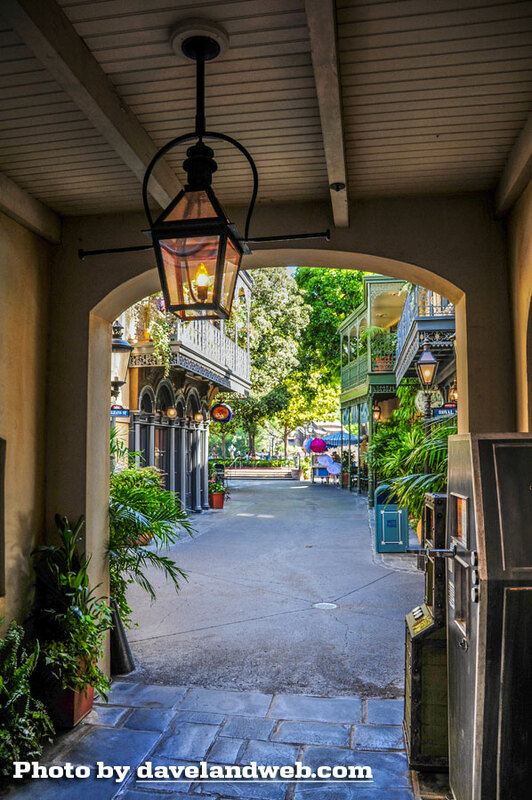 Up until the last few years, Club 33 has sailed through Disneyland history as a hidden part of the New Orleans Square landscape. It was that elusive place that some were aware of but weren't quite sure exactly where or what it was. 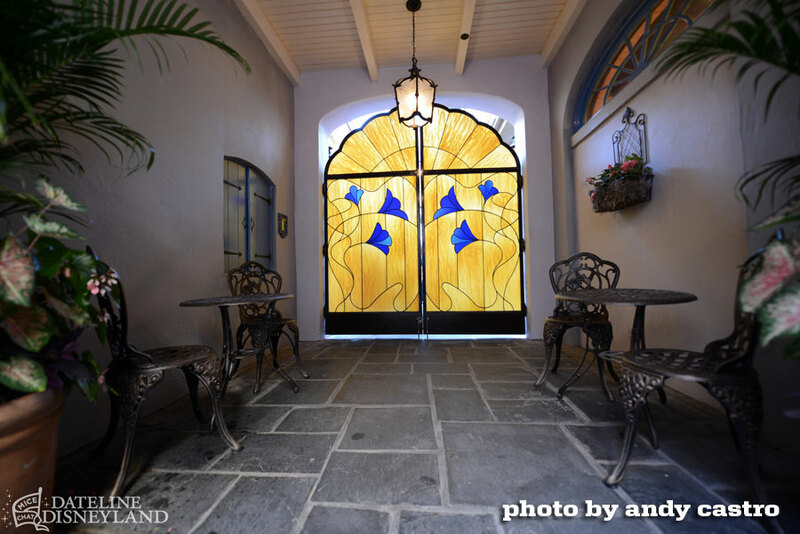 Many have been fortunate enough to visit, thanks to the generosity of a friend of a friend, but only a select few who patiently suffered through the years-long wait list were actually members. 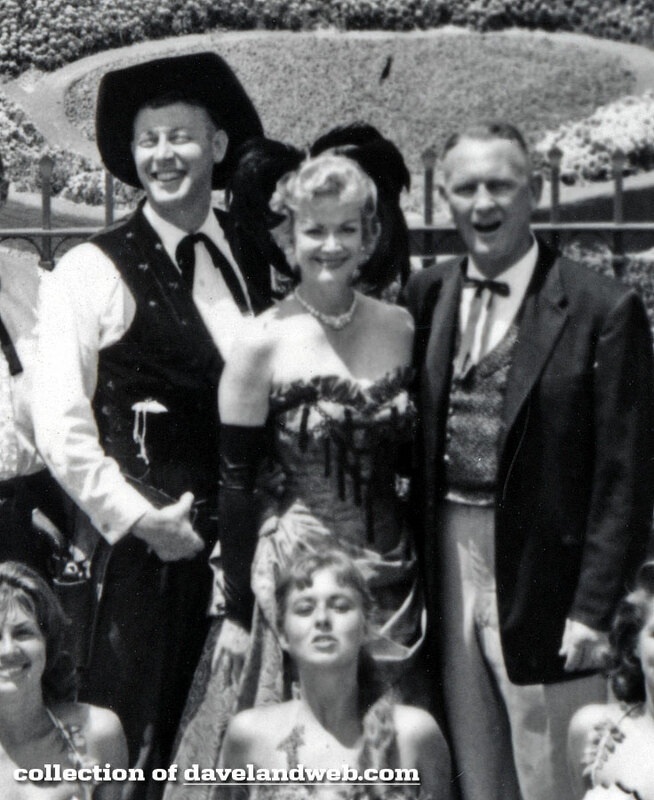 They enjoyed the camaraderie of other long-time members and the ability to experience Walt's park in a private setting that he had helped conceive and design. 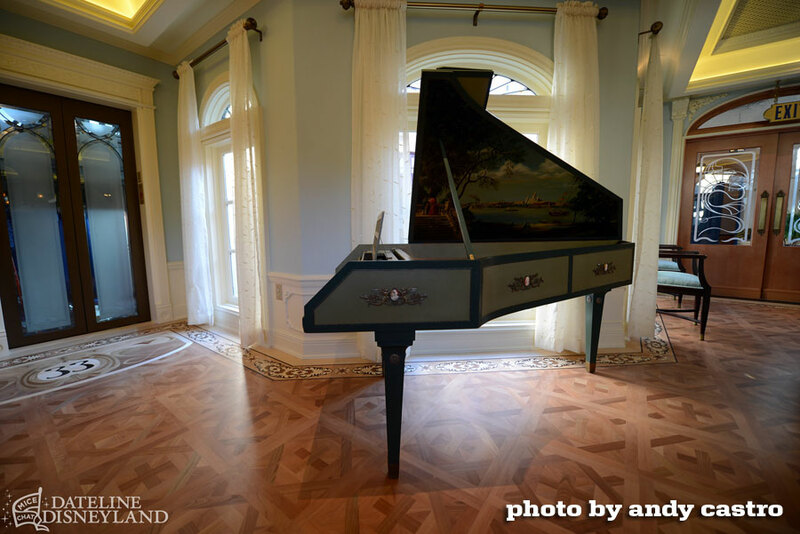 Rich with history, there were a number of personal artifacts that he and Lillian had hand-picked for the decor. 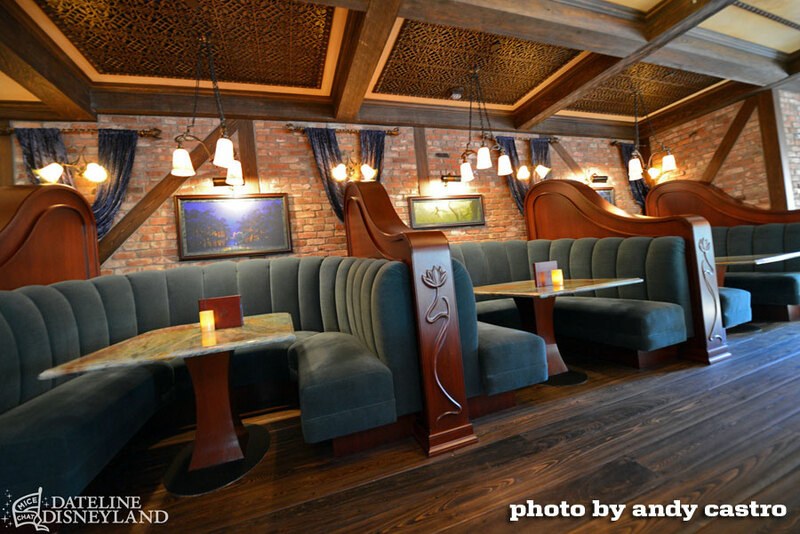 Its dark and richly adorned interior just positively oozed Walt Disney. 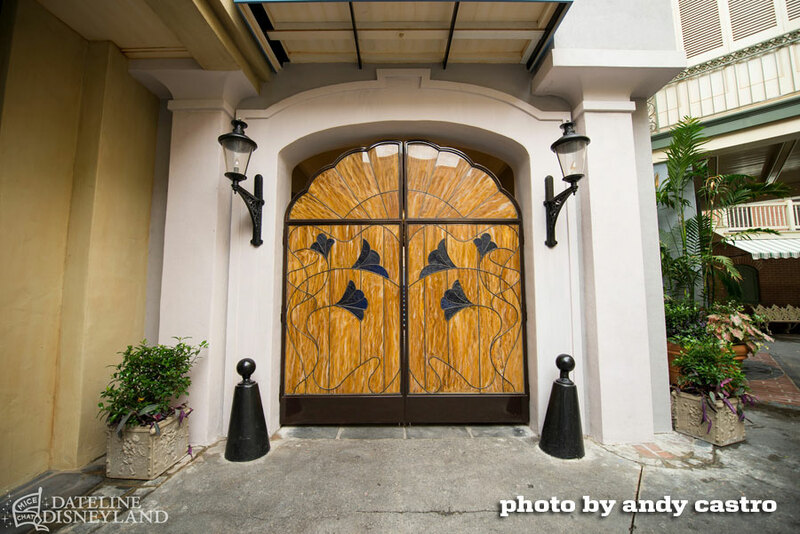 The once understated entry door (shown above), which was probably not even noticed by 80% of the people who walked by it, has given way to a more lavish (but not necessarily better designed) and ostentatious entrance. If you're not a member and can't afford the dues, that fact is now shoved in your face. Faux candles adorn the new addition above. Really? 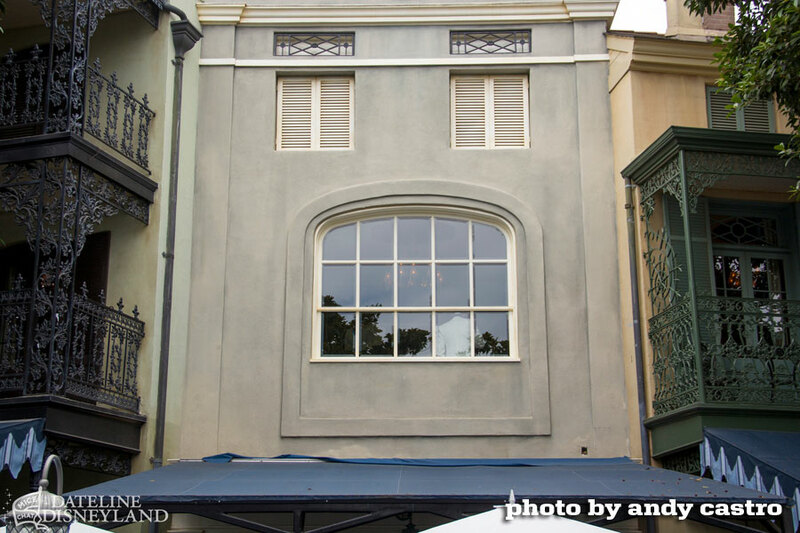 Once unable to see inside the Club, brand-spanking new windows allow the guests who only pay $125 or so (and that's just to get into the Park) to see exactly what they're missing. For Club members though, the view is lovely. The Disney Corporation is sending a very clear message to the public. 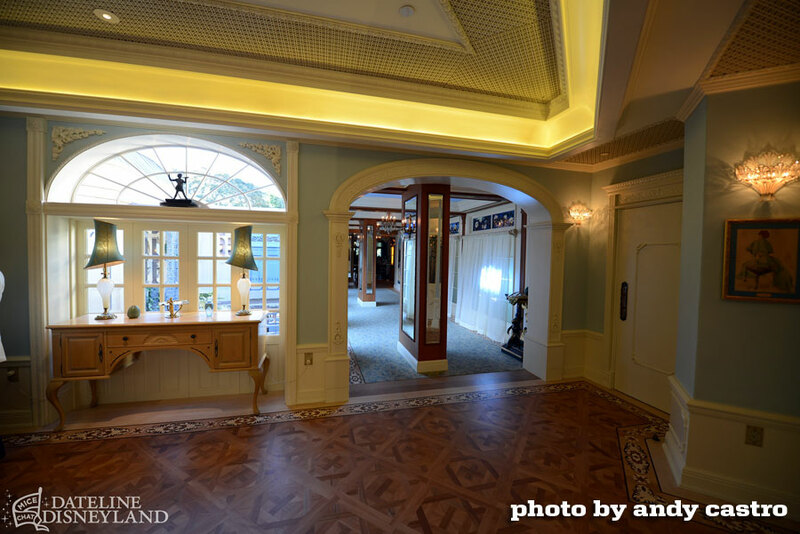 If you think only the regular paying guests are getting the shaft, come back tomorrow for an inside look at the "new" Club 33 and hear what many of the members are grumbling about. I'd say I got my mileage out of that photo! 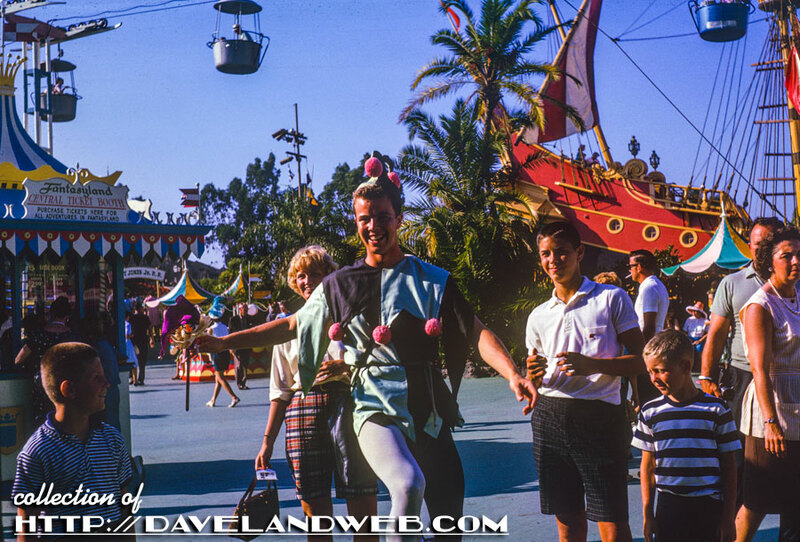 See more Daveland Disneyland Character photos at my main website. 4th of July Firework Bonanza!